My hair used to be long, strong, thick & shiny. Thanks to my Mom's great care & attention. Recharging my hair will recharge my life & stop this curse. Terrible as they find my hair in dishes/food when they look! I decided– I’ll recharge my hair & no more be embarrassed! I’ll recharge my life too so that all will love me a bit more! Perhaps my recharged hair will put me on a magazine cover! I need to recharge my hair to let my hair down! To let my curls rock & roll, dance in joy & not frown! I’ll be ready to party & style my hair in many ways! I wanna celebrate life’s party everyday & feel alive! eheheeh this was tooo cute!! and along with the pictures...too good!! the personal touch makes this a great entry. all the best for contest. Thanks a lot Namrota! Best wishes to you too, dear! This form of expression (pictures + poem) will make anyone read till end. Appreciate how easily you have weaved the message into a poem, one of the most challenging forms of expression in my opinion. Describing childhood, studentship and adulthood and a hint of your real life experince made the story look real. Thanks a lot for the cool recognition, appreciation & wish, Saket! A lovely post with lovely pics. All the best. Thanks for stopping by & sharing! Delighted that you liked it! Such a lovely poem ! Loved the rhymes ! 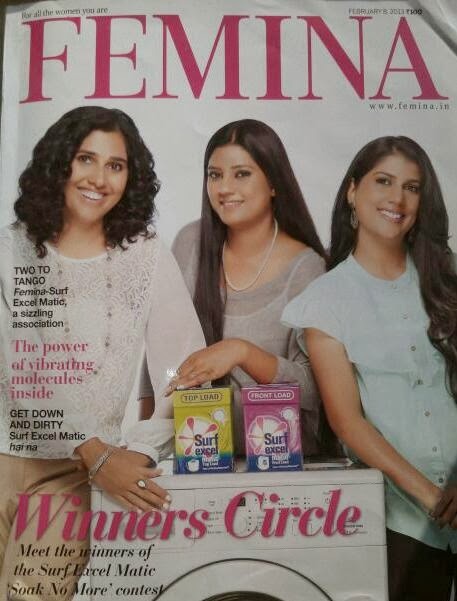 And oh my you look so alive and gorfeous on the Femina cover!!!! Thanks Maniparna :) Delighted that you liked it! All the best dear! Anita, you have amazingly presented this post. Just incredible. Best of luck for the contest. Or have you written another post? Indrani, Glad I didn't do that coz there are a number of Posts with Bollywood Song references! Hee hee, Seeta :) I thought I had to mention this problem as it's fairly common when I cook!